One of the Best by Seymour Hicks and George Edwardes. Esther Coventry was played by Henrietta Watson, not Jessie Millward, from 30 Jan to 26 Feb 1896. "One of the Best" is fitly named. Produced on Dec. 21, Messrs. Seymour Hicks and George Edwardes' melodrama has run to crowded houses ever since and is likely to do so for a long time to come. The play is picturesque, for, with a keen instinct for effect, the authors decided on staging a Highland regiment, than which there is surely nothing more striking in the whole range of military uniform. They have also told a story, which, if un-English, has had the advantage of actuality across the Channel in the shape of the Dreyfus incident; and, at a time when the country palpitates with melodrama, it is not surprising that "One of the Best" should be a great success. 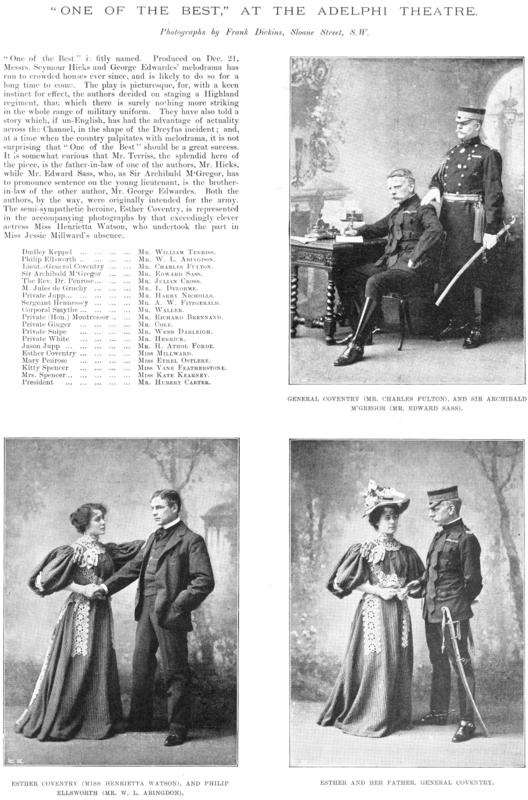 It is somewhat curious that Mr. Terriss, the splendid hero of the piece, is the father-in-law of one of the authors, Mr. Hicks, while Mr. Edward Sass, who, as Sir Archibald M'Gregor, has to pronounce sentence on the young lieutenant, is the brother-in-law of the other author, Mr. George Edwardes. Both the authors, by the way, were originally intended for the army. The semi-sympathetic heroine, Esther Coventry, is represented in the accompanying photographs by that exceedingly clever actress, Miss Henrietta Watson, who undertook the part in Miss Jessie Millward's absence. Dudley Keppel Mr. William Terriss. Philip Ellsworth Mr. W. L. Abingdon. Lieut.-General Coventry Mr. Charles Fulton. Sir Archibald M'Gregor Mr. Edward Sass. The Rev. Dr. Penrose Mr. Julian Cross. M. Jules de Gruchy Mr. L. Delorme. Private Jupp Mr. Harry Nicholls. Sergeant Hennessey Mr. A. W. Fitzgerald. Private (Hon.) Montressor Mr. Richard Brennand. Private Snipe Mr. Webb Darleigh. Jason Jupp Mr. H. Athol Forde. Mary Penrose Miss Ethel Ostlere. Kitty Spencer Miss. Vane Featherstone. Mrs. Spencer Miss. Kate Kearney.